Pentecostals are distinguished by their unique belief that an individual can serve as a conduit for supernatural gifts endowed by the Holy Spirit or Holy Ghost, such as speaking in tongues, prophecy, discernment, and faith healing. Although similar to the Charismatic movement within the mainstream churches, modern Pentecostalism developed earlier and formed separate denominations, while Charismatic Christians tended to remain within their churches of origin. The largest Pentecostal denomination in existence today is the Assemblies of God with a membership of about 51 million worldwide. Pentecostals subscribe to the belief that the "baptism of the Holy Spirit," as exemplified by the apostles' experience in the Book of Acts, is necessary for Christian growth and empowerment. For many Pentecostals it is one of the key steps in Christian conversion. Water baptism is also essential, following one's decision to commit oneself to Christ. However, water baptism is not the same as the baptism of the Holy Ghost, which is a distinct spiritual experience. 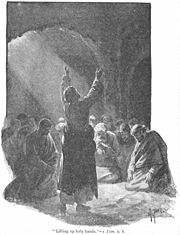 The apostles receive the gift of the Holy Spirit, as described in the Book of Acts. Like other Christians, Pentecostals believe that one must be saved by repenting of one's sins, accepting Jesus as Lord and Savior, thus being forgiven of sins, and receiving the Holy Spirit. Most Pentecostals believe that the initial sign of the baptism of the Holy Spirit is speaking in tongues. Many Pentecostal denominations teach that speaking in tongues is a gift from God available to all Christians regardless of denominational affiliation, but do not go so far as to declare it necessary for salvation. Some, however, do insist that without speaking in tongues, one is not truly saved. Currently, there are two basic streams of Pentecostalism. The more widespread group adheres to baptism in the name of the Trinity: the Father, the Son, and the Holy Ghost. The second group, often known as "Jesus Name" or "Oneness" Pentecostals, adheres strictly to the text found in Acts 2:38 indicating that believers should repent and be baptized "in Jesus' name." Oneness Pentecostals thus require the re-baptism of those who were previously baptized in the name of the Trinity. A nuance of Pentecostalism that has had a profound effect on Protestant worship overall is its strong emotionalism in worship and prayer. Pentecostals are known for raising their hands while singing, praying aloud in a fervent manner, and sometimes jubilantly running through the aisles during church services. Cries of "Thank you, Jesus!" and "Hallelujah!" or other spontaneous expressions of praise are also common. The aforementioned events can happen spontaneously during a normal service with no forewarning, by direct guidance from the leader of the service, or at massive altar calls where the entire congregation is encouraged to come and pray together for various purposes at the altar. Many early Pentecostals believed that the twentieth-century revival of the gifts of the Spirit was a sign from God of the "latter rain," a period of restoration before the end of the age and the coming millenial reign of Christ. Traditional Protestants believe that one is baptized with or in the Holy Spirit upon regeneration, the work of the Holy Spirit that enables faith and belief in the unbelieving heart. Pentecostals would not deny that regeneration is an activity of the Holy Ghost or that it results in the indwelling of the Holy Spirit in the believer. Instead, they distinguish this indwelling from a subsequent, more intense relationship with the Holy Spirit. Theologically, most Pentecostal denominations are aligned with Evangelicalism in that they emphasize the reliability of the Bible and the need for the transformation of an individual's life with faith in Jesus. Pentecostals usually adhere to the doctrine of Biblical inerrancy, although, unlike traditional Christians, they allow for and even encourage continuing revelation through prophetic messages received through the Holy Spirit. Another distinct Pentecostal belief is that there is a second work of the Holy Ghost after initial conversion, in which the Holy Ghost dwells more fully in the believer, and which opens one up to a closer fellowship with God, empowering him or her for Christian service. Other Pentecostals believe that Holy Ghost baptism is the distinct event of the Holy Ghost taking up residence in the believer's heart rather than a "fuller dwelling" or "second filling." Pentecostals vary in their beliefs concerning the types of glossolalia (1 Cor. 12:28). The following are some possible distinctions. First, there is the evidence at the baptism of the Holy Ghost. This is when a believer speaks in tongues when they are first baptized by the Holy Ghost. For some, this may be the only time an individual ever speaks in tongues, as there are a variety of other "gifts" or ministries into which the Holy Spirit may guide them. Secondly, there is the specific "gift of tongues." This is when a person is moved by God to speak in tongues during a church service or other Christian gathering for everyone to hear. The gift of tongues may be exercised anywhere; but many denominations believe that it must only be exercised when a person who has the gift of "interpretation of tongues" is present so that the message may be understood by the congregation (1 Cor. 14:13, 27-28). "Lift up holy hands in prayer (Tim. 2:8). Critics charge that Pentecostal doctrine does not mesh well with what they believe to be Paul's criticism of the early Corinthian church for their obsession with speaking in tongues. It is argued that Paul stated that speaking in tongues is only one of the gifts of the Spirit and is not gifted to all (1 Cor. 12:12-31). Defenders of Pentecostalism answer that Paul did not criticize speaking in tongues per se, but only the disorderliness with which the gift was exercised at Corinth. Another trait that most often distinguishes Pentecostals from other Evangelical Christians is their openness to new prophecy. Although identified as one of the gifts of the Spirit, most Protestants generally believe that Christian prophecy ended sometime shortly after the apostolic age. It is not uncommon for today's Pentecostal church leaders and even congregants to use this gift within the context of a church service to exhort a fellow brother or sister, or even to comment on current events or predict future ones. Anointing with oil, as in the early Christian church, is a practice in some Pentecostal churches performed during the consecration or ordination of pastors and elders as well as during healing of the sick. The word "anointing" is also frequently used by Pentecostal Christians to refer to the power of God or the Spirit of God residing in a Christian—a usage that occurs from time to time in the Bible. A particularly popular expression is "the anointing that breaks the yoke," which is derived from Isaiah 10:27. 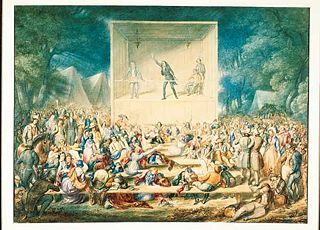 Camp meeting revival, a the precursor of Pentecostalism. Pentecostalism traces its original roots to the day of Pentecost when a week after Jesus ascended into Heaven, 120 believers waited for the promise of the coming of the Holy Spirit. 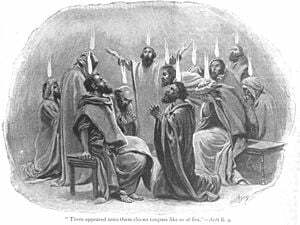 In Acts 2:4, when the Holy Spirit came upon these believers, they all spoke in tongues. Throughout the last 2000 years there have been various references to the in-filling of the Holy Spirit and outward sign of glossolalia. The modern era Holiness movement was the first to begin making numerous references to the term "Pentecostal." In 1867 The National Camp Meeting Association for the Promotion of Christian Holiness declared: "We are summoning, irrespective of denominational tie… those who feel themselves comparatively isolated in their profession of holiness—that all would realize together a Pentecostal baptism of the Holy Ghost." Around 1901, Pentecostalism was given a public platform when Agnes Ozman received the gift of tongues during a prayer meeting at Charles Fox Parham's Bethel Bible College in Topeka, Kansas. Parham, a minister of Methodist background, formulated the doctrine that tongues was the "Bible evidence" of the baptism of the Holy Ghost. Parham later left Topeka and began a revival meeting ministry. In 1905, Parham started preaching in Texas and began a Bible College in Houston, where a black preacher named William Joseph Seymour, a son of freed slaves, was required to listen to Parham’s lectures outside the classroom through a half-opened door. In spite of this act of racism, Seymour became convinced of Parham's views. The leadership of the movement was soon to pass to Seymour and take on international dimensions. In 1906, Seymour spearheaded the watershed of the Pentecostal movement in the U.S. and the world—The Azusa Street Revival. It began on April 9 in Los Angeles, California, at the home of Edward Lee. Seymour claimed that he was overcome with the Holy Ghost on April 12, 1906. On April 18, the Los Angeles Times ran a front page story on the revival, Weird Babel of Tongues, New Sect of fanatics is breaking loose, Wild scene last night on Azusa Street, gurgle of wordless talk by a sister. By the third week in April, the small but growing congregation rented an abandoned African Methodist Episcopal Church at 312 Azusa Street and subsequently became organized as the Apostolic Faith Mission. Almost all mainline Pentecostal denominations today trace their historical roots to the Azusa Street Revival. The movement's inception was counter-cultural to the social and political norms of society. Record numbers of African-American men and women were initial leaders. 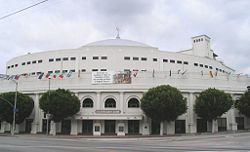 During the first year of the revival in Los Angeles, a group of African-American elders appointed by the General Overseer of the newly formed Holiness Church of God in Christ (COGIC), Charles Price Jones was sent to investigate reports of Azusa Street. At the helm was Elder C.H. Mason. Struck by what he witnessed there, Mason began preaching and teaching the Pentecostal message upon his return to Tennessee. Unconvinced by this new doctrine, Overseer Jones continued to lead his COGIC adherents as a Holiness church, changing the name in 1915 to the Church of Christ, Holiness (USA). Mason, however, called a conference in Memphis, Tennessee and reorganized the Church of God in Christ as a Holiness Pentecostal body. As the only officially incorporated Pentecostal church, Mason's COGIC held a position of leadership in the rapidly growing faith. 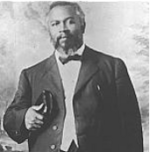 Bishop Charles Harrison Mason, founder of the Church of God in Christ, Inc.
As the Azusa Street Revival began to wane and the pressure from social, cultural and political events of the time increased, doctrinal differences surfaced more and more within the Pentecostal movement. In approximately 1913, a number of pastors and leaders separated themselves from the Church Of God In Christ. This split was due, in part, to racial tensions and societal laws requiring segregation. A new, mostly white group organized itself as the Assemblies of God. When this group left, COGIC became a mostly-black denomination, as it is today. It remains now the largest African-American Pentecostal body in existence. In 1915, a group of Oneness believers broke away from the Assemblies of God, organizing itself as Pentecostal Assemblies of The World in 1919 under Bishop G.T. Haywood. More Oneness denominations later emerged, such as the United Pentecostal Church, founded in 1945, and others. Other splits also became apparent. Wanting not to affiliate with the Assemblies of God, a group of ministers from predominantly white churches formed the Pentecostal Church of God in Chicago, Illinois in 1919, citing the Assemblies' strict doctrine against divorce and remarriage. The Church of God, Cleveland, Tennessee, made significant inroads across racial divides, with a missionary ministry to the Bahamas and elsewhere. In 1923, the Church of God suffered a deep split over General Overseer A. J. Tomlinson's autocratic management of church issues. After the 1923 divide, the bulk of the black membership followed Tomlinson into the Church of God of Prophecy. Meanwhile, George Went Hensley—-who had left the Church of God, Cleveland, Tennessee when it ceased the practice of snake handling—-is credited with creating the first church dedicated to this extreme practice in the 1920s. In urban African-American communities of the 1940s, Father Divine and Daddy Grace emerged, encouraging their followers to practice Pentecostalism in a manner widely criticized because of the leaders' alleged claims to divinity. In the last part of the twentieth century the Word of Faith movement, the Toronto Blessing, and the Brownsville movement became some of the better known splinter groups that have appropriated the mantle of Pentecostalism emphasizing the more extreme non-traditional practices of the movement. These include the practice of divine laughter, political dominionism, ecstatic barking, creative visualization, fetishism, and making seed money donations said to yield divine reward. Many maintain that African-Americans can be credited with much of the movement's success. In fact, there are several theories that say that because the pioneers of Pentecostalism were from churches rooted in the nineteenth century African-American culture, the religious expressions of Pentecostalism are themselves a reflection of the African religious culture from which black slaves had been wrenched. Azusa Street Revival leader Seymour himself was deeply affected by black slave spirituality. Black Pentecostal scholar Leonard Lovett said that "black Pentecostalism emerged out of the context of the brokenness of black existence… their holistic view of religion had its roots in African religion" (MacRobert 1988: 77-78). The main features of this African American spirituality are considered oral liturgy, narrative theology and witness, the maximum participation of the whole community in worship and service, the inclusion of visions and dreams into public worship, and healing through prayer. Furthermore, rhythmic hand-clapping, the antiphonal participation of the congregation in the sermon, the immediacy of God in the services may all be "survivals of Africanisms." These expressions were fundamental to early Pentecostalism and largely remain in the movement to this day. The African roots of Pentecostalism help explain its significance in developing nations countries, such as Jamaica, Haiti, and Guatemala. In Sweden, the first Pentecostal church was Filadelfiaförsamlingen in Stockholm. Pastored by Lewi Pethrus, this congregation, originally Baptist, was expelled from the Baptist Union of Sweden in 1913 for doctrinal differences. The history of Pentecostalism in Australia has been documented by Dr. Barry Chant in Heart of Fire (1984, Adelaide: Tabor). Another watershed within the Pentecostal movement is the "Memphis Miracle," a meeting by Anglo Pentecostal leaders and African-American Pentecostal leaders. This unification occurred in 1998 in Memphis, Tennessee at the headquarters of the largest African-American Pentecostal body, the Church of God in Christ. The unification of Anglo and African-American leaders led to the restructuring of the Pentecostal Fellowship of North America to become the Pentecostal/Charismatic Churches of North America. The magazine Christianity Today reported that approximated 25 percent of the world's Christians are Pentecostal or charismatic. However, estimated numbers of Pentecostals vary widely. Lower estimates place the figure near to 22 million, while the highest estimates apparently place the figure between 400 and 600 million. According to a Spring 1998 article in Christian History, there are about 11,000 different Pentecostal or charismatic denominations worldwide. The largest Pentecostal denominations in the United States are the Assemblies of God, the Church of God in Christ, New Testament Church, Church of God (Cleveland), Pentecostal Assemblies of the World, Assemblies of the Lord Jesus Christ, and the United Pentecostal Church. The size of Pentecostalism in the U.S. is estimated to be more than 20 million, counting all unaffiliated congregations, including approximately 918,000 Hispanic-Americans. Toronto Canada, has a large Pentecostal population. The influence of immigrants from Jamaica, Africa, Latin America, Korea and basically everywhere, have created diverse churches throughout the city. In Australia, Hillsong is the largest Pentecostal church with a membership exceeding 19,000. Despite modern Pentecostalism roots in the U.S., the great majority of Pentecostals are to be found in Developing Countries (see the Statistics subsection), although much of their international leadership is still North American. Pentecostalism is sometimes referred to as the "third force of Christianity." The largest Pentecostal Christian church in the world is the Yoido Full Gospel Church in South Korea. Founded and led by David Yonggi Cho since 1958, it reported 780,000 members in 2003. Missions expert David Barrett estimated in a Christianity Today article that the Pentecostal and charismatic church is growing by 19 million per year. The late Jeffrey K. Hadden at the Department of Sociology at the University of Virginia collected statistics from the various large Pentecostal organizations demonstrating that the Pentecostals are experiencing very rapid growth. In Myanmar, the Assemblies of God of Myanmar is one of the largest Christian denominations. The Pentecostal churches Igreja do Evangelho Completo de Deus, Assembleias de Deus, Igrejas de Cristo and the Assembleias Evangelicas de Deus Pentecostales are among the largest denominations of Mozambique. According to the last census in Brazil, 25 percent are Protestants, most of them are Pentecostals or Charismatics, including members of the Assemblies of God, Christian Congregation of Brazil, Foursquare Gospel, Universal Church of the Kingdom of God, and Charismatics Baptists. The Assemblies of God (Assembléia de Deus) of Brazil reports about 10 million members. Among the Indian charismatic denominations are the Apostolic Church of Pentecost, Apostolic Pentecostal Church, Assemblies of Christ Church, Assemblies of God, Bible Pattern Church, Church of God (Full Gospel) in India, Church of God of Prophecy, Church of the Apostolic Faith, Elim Church, Nagaland Christian Revival Church, New Life Fellowship, The Pentecostal Mission (New Testament Church), Open Bible Church of God, Pentecostal Free Will Baptist Church, Pentecostal Holiness Church, Pentecostal Mission,United Pentecostal Church in India, India Pentecostal Church of God and the Sharon Fellowship Church. Rex Humbard (b. 1919) The first successful TV evangelist of the mid 1950s, 1960s, and the 1970s and at one time had the largest television audience of any televangelist in the U.S.
↑ World Growth at 19 Million a Year. www.ctlibrary.com. Retrieved August 25, 2007. ↑ Jeffrey Hadden at University of Virginia. religiousmovements.lib.virginia.edu. Retrieved August 25, 2005. Blair, William, and Bruce Hunt. The Korean Pentecost & the Sufferings which Followed. The Banner of Truth Trust. ISBN 0891512445. Chant, Barry. Heart of Fire. Adelaide: Tabor, 1984. Encounter: Journal for Pentecostal Ministry. www.encounterjournal.com. European Research Network on Global Pentecostalism (GloPent). www.glopent.net. Flower Pentecostal Heritage Center. www.iFPHC.org. This page was last modified on 4 February 2019, at 23:21.